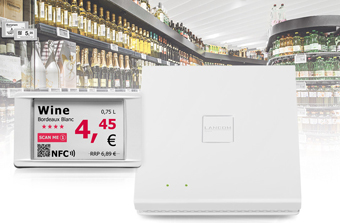 The Wireless ePaper solutions from LANCOM enable you to implement electronic room signage and help your company to appear even more modern and attractive. The LANCOM Wireless ePaper Displays are digital displays that offer versatility, automated processes, and a reduction in overall operating costs. Wireless ePaper Displays from LANCOM offer state-of-the-art digital signage for a wide range of applications in any area of business. The content shown on LANCOM Wireless ePaper Displays is centrally managed by a LANCOM Wireless ePaper server. How to setup the transfer of data to the Wireless ePaper Displays directly from calendar management systems, like Exchange, Domino, Google Calendar, or Office 365, is explained in detailed instructions available from LANCOM. An integrated API means that the LANCOM Wireless ePaper Server combines with any other system. The package includes sample images and calendar templates, but of course you can create and upload your own designs. Active signage for meeting rooms, conference rooms, etc. With the LANCOM Wireless ePaper solutions, ongoing and upcoming meetings and events are automatically synchronised with your calendar management system (e.g. Domino, Exchange, Google Calendar, Office 365) and are presented on the LANCOM Wireless ePaper Displays at each meeting room. 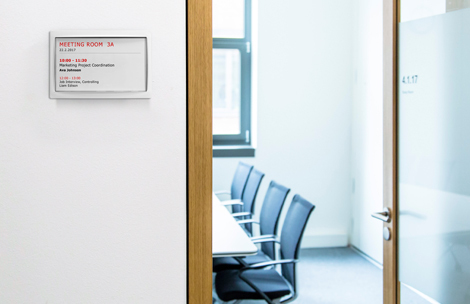 At the same time these innovative room signs improve transparency, because employees and your visitors always see the latest information about ongoing events. This makes the LANCOM Wireless ePaper Displays a modern and practical eye-catcher. LANCOM Wireless ePaper Displays simplify workflows and create transparency at offices, schools, universities or hospitals. By automatically synchronising with the corresponding database, the occupancy of offices, classrooms, or hospital rooms shown on the LANCOM Wireless ePaper Displays is up-to-date at all times. Hotels and restaurants can use the Wireless ePaper Displays in their restaurants as highly convenient menu cards or as seat-reservation signs. They also offer ideal and modern customised signposting at their premises, such as during conferences. Retailers are already taking advantage of digital price labels, also known as electronic shelf labels (ESL). Prices, articles, and even bar codes or QR codes can be maintained automatically by the central ERP system in near real time. This makes paper labels a thing of the past.